When you get around to making those crucial decisions about building a website one question you will need to answer is what type of CMS (content management system) you will plan to use. These days many people prefer to use a content management system for building a blog or website as it makes it a lot easier for people with no web design experience to make minor changes to the website such as adding blog posts, uploading new images or making small edits to your key pages. In this post I will be running through the most popular content management systems out there – WordPress, Joomla and Drupal. Each of these platforms offer a huge amount of functionality and depending upon the type of website you want to create (blog, online store, portfolio, etc.) will also determine which CMS you may end up using for your new site. Here you can find my list of the best blog sites. Of course the main appeal of any good CMS is it’s ease of use. This is why a CMS is a good choice for any one that has a team of people managing their website who do not have any web development skills or very little technical expertise. A good CMS will be SEO friendly, conforms to the latest web accessibility and international standards, is flexible to your future needs and offers an excellent return on your investment. Currently WordPress powers over 26.4% of all websites on the world wide web and of these three major CMS players it has a 58.4% marketshare. I’m excited to have these comparison’s. I may have to do some extensive testing to find the one for what i am looking for. One thing that concerns me. There isn’t much mentioned on security. Otherwise. Thank you for the tips. Enjoyed reading this. I will look to add a section on security in the next week or so. It’s totally up to you. If you have the money to spend on hosting and a domain name, then I’d advice you do that. Think of it as buying real estate on the internet. It’s yours to do as you wish with and to build something that potentially you can make money from. WordPress.org, self hosted with someone like Bluehost or Inmotion. UAB is currently using Joomla and I was wondering how good Joomla was compared to Drupal. This helps a lot! Leon. I am glad to see this chart helped you out! It all depends on what you’re going to use it for. WordPress.org is the best blogging platform as far as I’m concerned. 75 million people can’t be wrong. Agree with you on security. I defintiely agree with this article. WordPress isn’t much more than a blogging platform and joomla and Drupal aren’t very dynamic systems either. Again, there is no “best CMS”. Centralpoint is a UXP (User Experience Platfform) providing CMS, Portals, Reporting, SSO, RIA, Email alerts to manage all of your users needs. In looking for a new system I researched a ton of reviews of potential systems, but oxcyon stood out from the crowd. The CP script feature works alot like wordpress short codes, and gives me access to a ton of features that speed up my work within the system…and it’s built right in the editor, so I don’t have to leave the page to see what I am doing. This is certainly one of the best comparisons. As a WordPress evangelist, i’ve often found Joomla users to be heavily stuck to their platform and unwilling to see where WordPress is now vs. 4-8 years ago. I switched some 5 years ago and believe i’ve witnessed a huge shift in approach to what it is and what it can do. Much of this has been reflected in the wp-core and in larger plugin vendors (WooCommerce for example). It’s a strange little world that’s sprung up around blogging software that has long since mutated into an extremely flexible platform for everything from corporate sites to complex applications. You have to leave the engineering at the door and go two feet first into the more innovative qualities of working with WordPress. Sorry for the biased rant. Watching 3 guys develop a massive project with no resources, taking up months of time writing disposable code, that could be implemented and scalable in a week on WordPress. Really nice infographic – I’m currently a WordPress user but I’ve worked with Joomla! and Drupal so I think each serves a specific need in the ecosystem and it’s good to have options and choices. I’ve seen features built for one platform make its way to another after considerable adoption and praise. In some ways, each platform acts as a testing ground for the other platforms. “With each release, [Drupal] becomes easier to use.” Have you tried actually doing anything with Drupal 8? It’s a nightmare. It requires much higher level of technical understanding than Drupal 7 and most of the admin is supposed to be done with an archaic command-line tool called drush. Fourteen months after release, most of the “essential” contributed modules haven’t been ported yet and are still in Alpha. Avoid, unless you’re a pro developer. Excellent post with some good arguments Jamie. I am not an advocate of open-source CMS. While there are huge communities of developers that love these systems, I still think that the best content management system is a proprietary system. I created my first website on WordPress two years ago and immediately realized that this is exactly what I was looking for, namely the most important: you have no restrictions, great opportunity to earn money from your blog and most of all, be your own boss. I previously created websites for various services, like universities cms, and was not happy, solid limits, pay more money and remove the restrictions obdiralovo. After payment and the removal of restrictions found that there that promise the settings are scarce, primitive. I have to disagree with you a bit. WordPress is far better all round than Joomla. Fact. WordPress has a huge community and vast amounts of functionality that is accessible to the vast majority of WordPress.org users. I appreciated reading this comparison and wished I had read it prior to trying to decipher the 3. I would definitely say WordPress has taken the cake. I was recently building a client site and had decided that I was going to move into the other 2 know CMS systems. I was immediately drawn to Drupal but found I spent more time researching pages and pages of content in the forums. I also noticed and it sticks out to me to this day that a question was responded to in the forum telling informing the person asking the question that – This is something you should refer to google for not this forum, and I was a little disappointed in seeing that there must be “stupid questions” when trying to learn this platform. I have dabbled with Joomla as well but have not done a deep dive into the programming and CMS features of Joomla as it was much more convenient to trot home to Word Press and get all of what I needed and more done. 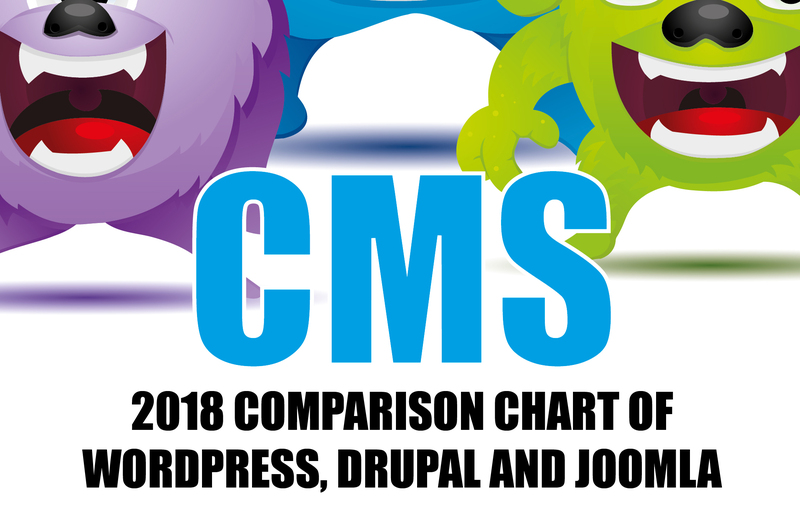 Just my $.02 but a very well put together comparison and I will definitely recommend to any one that is struggling with knowing the “meat and potatoes” of CMS. Many thanks for this post, it’s very useful (I missed other comparisons). The best decision taken for us was to choose Joomla. Since 3.0 SEO/SEF performance has improved a lot where it was during several yrs a weakness. Now we have Joomla our site is going from strength to strength! I don’t know specifics, but it should be noted in general that most CMS systems are vulnerable to exploits and there are people out there that actually use them. So, it’s crucial to keep your CMS up to date. I have recently had quite a nightmare with a Drupal site because I failed to keep up with the updates and the site was compromised due to an exploit that had since been patched. I am taking a dive into WordPress now, just because it is far more popular with clients, designers and developers I meet. thank’s again Jamie! This is a real help to me yet again! I work on WordPress for about a 5 years. For me it is a good engine. Easy to use, a planty of plugins and themes, and simple modification. I recommend to anyone WP – amateurs and programmers. I think this comparison underplays the strength of WordPress. Plugin are an integral part of the WordPress ecosystem. You say that Joomla is good for social networks and e-commerce. But some of the best social networking and e-commerce software – both open source and commercial – is easy to integrate with WordPress through plugins. In fact, there are WordPress plugins available to create business directory sites, dating sites, rating and review sites, online magazines, software purchase and download sites, and on and on. The huge WordPress plugin community allows developers to create virtually any type of site without writing custom code. One thing I don’t see in the comparison is native multilinual feature. This should be stated. I use both WP and Joomla. Getting a WP reasonably big-sized web multilingual may require blood, sweat and tears, mainly if you use the most popular plugin for this purpose. Not to mention if you also run WooCommerce in your web.,.. As far as the number of plugins is concerned, yes, the number of available plugins for WP is highest amongst the three CMSs. But probably this is due to the small set of true CMS core features that you find out of the box in WP. Very nice article I was little confused about what platform I choose to develop my eCommerce website but now I am clear about all three platforms. Thanks for sharing such a nice information. In my own opinion (coming from my experiences though) WordPress is the easiest to use and could be extended to be any kind of website, but is the least secure and is the most targeted by hackers. Drupal is the most complex(not to sound discouraging) but the most secure. Agree. But WordPress is getting stronger. And if you have good hosting and decent security settings and plugins, then you’ll be well protected. I have read your full post. It is the best graphical representation of information. You are right about WordPress popularity that it has more features and easy ti use. But Drupal is also one of the good CMS for complex website development. Almost all the major aspects of CMS are shown. I have developed many sites with Joomla and more recently with WordPress as it has been requested by specific clients. As someone else has pointed out, Joomla proponents do often tend to compare with WP of 5-8 (“just a blogging platform!”) years ago rather than the current version. Agree with you Paul. Thanks for the comment. I got nervous with the thought of moving away from Joomla. So I tried to shift our website to WordPress. It was easy to create a site, easy to add plugins – but I had to keep adding plugins to get the same functionality I had with Joomla and a handful of extensions in comparison. My site has lots of categories, cross thatching of articles and lots of articles. I went back to Joomla. The latest upgrades have been smooth and easy. And I’m spending less time trying to maintain the site. I think WordPress is great for the majority of people who don’t really need a complex site. But if your business has any complexity to it at all (we are a small school) – then Joomla works much better. And, although I’ve looked at Drupal – I’d say it really is for the dedicated developer for a large company. Thanks for sharing your experience and good luck with your Joomla site. If you need to manage a large number of images avoid wordpress. I set up a large gallery site on wordpress and the only way to find and delete images is manually. The media library isn’t user friendly. I tried a variety of image management plugins but after reviewing 400 images they slowed to crawl and then froze. WordPress was set up for bloggers and they can’t change their functionality without casting out their core user base. I’m going to explore joomla. I develop most of my websites in WordPress as clients want their website designed in WordPress. I much prefer working in Drupal. Great comparison. I’m long time Joomla user and worked on some WP projects. Also system administrator. WP is lighter and for some cases best CMS but Joomla was not same as was few years ago. Also multilingual site is almost impossible in WP and it is native in Joomla, and that is big deal for me. Also I recommend any firewall for WP to be installed ASAP. 10 days, no marketing and brute force attacks started. Having worked with all three CMS in the past (and present), since about 2005, imho there is no contest whatsoever. For my clients the key factor is usability – the ability to get in, manage and create content and get out again. I just installed Drupal 8.5.3 this morning on my dev server and was surprised that it is actually becoming less and less intuitive over time. Sure it is secure but if the client is tearing out their hair trying to perform simple tasks it is a fail. This has been an issue with Joomla from the get-go – multi-step procedures when a simple button would have sufficed. And I won’t even mention the conflicting plugins! As you may gather I much prefer WP for both my Mom and Pop clients right up to multi-author, multi-national clients needing performance at scale. The biggest issue I have found with WP is not that it is ‘not much more than a blogging platform’ (gimme a break!) but that it allows new devs to get into the market by overloading sites with bloated plugin-hell. Hmmm. Of course is no longer, “not much more than a blogging platform”. But it still feels like it. Both from the user interface, and as developer. Sure, it can do other stuff. But all of it feels like an after-thought – whether it’s using css to wrangle with html over which you have no control, or using a plug-in – which you need to do the most basic things (because there isn’t any functionality out-of-the-box). My first foray into open source CMS was Drupal. It didn’t last long – impenetrable. I had been a developer professionally a decade before. But the learning curve was too steep. For my first project I used WordPress. I treated it as an add-in to the rest of my site. I only wanted the blogging engine. It was fine. My next project was Joomla. It takes a while to “get it”. But once you have got it, it’s immensely powerful out-of-the-box. I have used it often since. A couple of years ago I was asked to do a corporate CMS for a small consultancy. I thought the learning curve for Joomla was too steep for the end user, so I opted for WordPress. I got on better with it that time. But still it felt limiting. I am working on something now that requires applying control over who can access, edit, update what content. I can’t imagine attempting to do something like that in WordPress. Maybe it’s just familiarity, but Joomla! wins hands down for me every time – unless I just want a blog.